Washington Island has its own version of Starbucks. 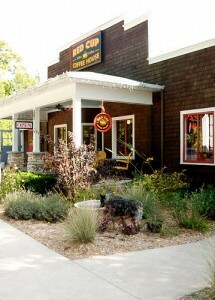 The “Red Cup” is a cozy and unique coffee house serving up “killer coffee”, smoothies etc. as well as great pastries, bagels and sandwiches. It is an eclectic delight where islanders and visitors alike come to either sit on the charming porch or sink into a vintage couch indoors to relax and chat with each other, strangers and friends alike. There are artsy things for sale from one of a kind pieces of jewelry to hand-made shawls and pottery. This is not your average souvenir venue nor will you find your average souvenirs here! What you will find is a warm and inviting haven to have a great cup of joe and put up your feet. By the way, right next door is a terrific book store well worth a look-see. "Washington Island is home to Sievers School of Fiber Arts, an internationally known visual arts & crafts school offering classes spring, summer & fall"